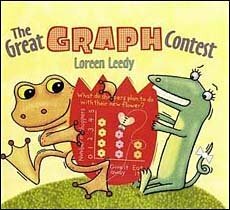 The Great Graph Contest -- a cute book for teaching graphs! 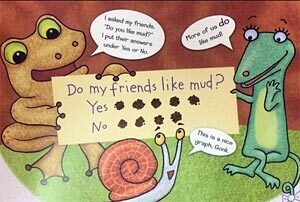 In The Great Graph Contest, best friends Gonk the Toad and Beezy the Lizard compete to see who can make the best graph and in the process, they explore (1) data collection methods like surveys and tallies, as well as (2) graphing methods like line graphs, bar graphs, and more. This book is an AAAS Science Books & Films Honor Book! Leedy's trademark illustrations definitely keep kids' attention and are full of clearly presented graphs. Unlike most Leedy books which are too packed for read alouds, this title would work well as a read aloud or independent reading. Overall, very well done! In a starred review, School Library Journal said, "designed to inform and entertain... An exciting and energetic math resource." And Booklist said "natural for curriculum use, this is an entertaining, easy-to-follow introduction..."
Survey Friends: Ask your friends a question such as 'How many pets do you have?' or 'What is your favorite sport?' Survey each friend and write down their answer. Decide which kind of graph is the best way to display the information, then make a poster with construction paper and markers." Goofy Graphs: Think of a fun graphing question such as: "If you could be any animal, what would you be?" Take a survey of your class, group the answers into appropriate categories such as Reptile, Mammal, Bird, and Imaginary, then make a graph to display the results. What's the most popular answer? Where in the World is My Family From? : Find out what countries or states your classmates and family members are from. Make a graph to display the results. 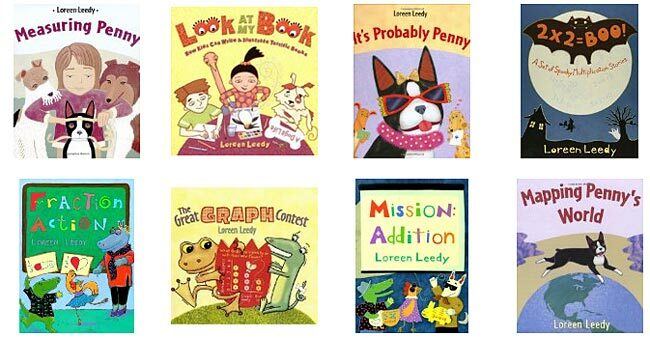 This is just one of a number of math books by Loreen Leedy. They are quite helpful to use when teaching math (although all share the 'problem' of being hard to use as a read aloud because of all the small details on the page.) If you teach math, you may also want to check out her other books by clicking on the link above or the sampling of book covers below.